The husband and I usually don't spend much on Valentine's day since February is the month of the Tucson Gem and Mineral Show and we blow all our money there. 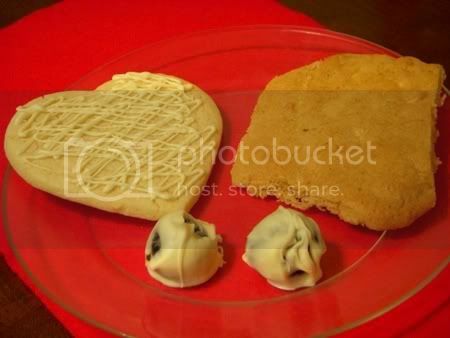 So this year I decided to save money and surprise him by making three different cookies using his favorite sweet, white chocolate. I made Oreo balls dipped in white chocolate, sugar cookies with white chocolate icing, and white chocolate chip cookies (which turned out oddly shaped since I didn't space them out enough). I made them early, the Thursday before Valentine's, so he could take the extras to work on Friday. Kevin's favorite were the white chocolate chip cookies. The recipe I used was from FoodNetwork.com (Emeril Lagasse). It was supposed to be a giant cookie cake (I left out all the nuts and bittersweet chips and put in extra white chocolate chips) but it was so thick that it didn't get cooked in the middle so I had to start over. I decided not to risk under cooking them again so I just made small cookies. My favorite were the sugar cookies. The recipe was also from FoodNetwork.com (Alton Brown this time). I had to bake them slightly longer than the time given in the recipe but I took them out when the edges were just barely brown and they were perfect - soft and not overly sweet. I melted white chocolate, put it in an icing bag and drizzled it over the top of the cookies. The Oreo balls were also good, though I think that dipping regular, non-balled Oreos in to white chocolate would taste just as good. And since they have cream cheese in them that means you have to keep them refridgerated which was a hassle. The recipe I used was from Allrecipes.com. I thought I'd share some party recipes that my team at Dunder Mifflin Infinity Ypsilanti came up with to help us celebrate the Superbowl. I arranged all the recipes in a PDF file so you can just print them all out at once. Each recipe is in it's own 4x6 box so you can also cut them out if you'd like. We had a vote to pick the top 3 recipes - the winners are indicated by a "1st", "2nd" or "3rd" place graphic next to the name of the recipe. I made the "Man Meat Minis" (lil smokies wrapped in bacon w/ brown sugar) for a Superbowl party yesterday and they were a hit!